Nikon's Monarch 5 ED. Now, ED Glass in a Mid-range Nikon! Now, ED Glass in a Mid-range Nikon! The new Monarch 5 ED was introduced to the market around mid-2013 with the interestingly different appearance as well as including extra-low dispersion (ED) glass for the objective lenses. 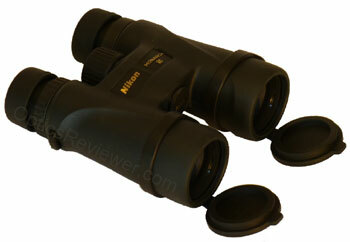 To get the ED glass in a Nikon binocular previously, a person had to step up to the Monarch 7 ED model and its pricing. The idea that Nikon would "push the ED glass feature down" to the Monarch 5 model was a wonderful plus for consumers! Why is that? If you're not yet familiar with ED glass, the benefits conferred by it amount to enhancing the color, contrast, resolution of details, and brightness of the viewed image. The contrast and resolution of details are improved by reducing the blurring between color lines. Because of this, using ED glass is beneficial for any binocular user who needs to see clearly and that would seem to mean nearly everyone! Many of the manufacturing details of the older Monarch 5s also apply to the Monarch 5 ED binocular. To save you from reading more than one review, however, we'll repeat those here for your convenience. As has been the case for a number of years, Nikon's chassis for the Monarch 5 ED is made of the lightweight, but durable, polycarbonate material — very similar to the polycarbonate resins used for automobile headlamp covers and personal water bottles, but reinforced with fiberglass to make it even stronger. This approach has been honed by Nikon to provide a durable binocular body at a very reasonable weight that will be comfortable to most users. The balance of the new Monarch 5 ED binocular is very good and we found that we were able to use it for extended periods without excessive hand, wrist, or forearm fatigue. That's something that takes on new meaning the afternoon of a full day's excursion into the great outdoors. If you're saddled with a binocular which is front-heavy (heavier on the objective lens end than on the ocular end), you'll certainly know it by that time! "I have been searching for a nice pair of binoculars for a while! My face is wider than average and therefore the Inter-Pupillary Distance or IPD is one of the top variables under my consideration. As a bonus to me, your website not only provides the IPDs for almost all of the models but it offers an extensive technical description of those items; the latter being an integral part of purchasing decision!" As you have come to expect in the Monarch 5 ED's price range, these binoculars are watertight. That means you can use them in a thunderstorm and they'll not get wet inside. It means you can drop them in water up to 3.3ft (1.0m) deep and watch them for ten minutes before pulling them out and finding them dry inside. Or, if you've dropped them into muddy water, you can rinse them off in the kitchen sink. Even more meaningful than the watertight aspect is the idea that when water can't get inside and moist air molecules have been replaced with dry nitrogen molecules (as Nikon has done with these binoculars), the glass surfaces inside the binocular won't become fogged. That's especially important when you remember that moist air inside a binocular begs fungi to grow and eat away the glass coatings which make your binocular special. The Monarch 5 ED binoculars have the convenient and popular twist-up and twist-down eyecups. The ones Nikon uses on this binocular have rounded outside edges which make them more comfortable when they're pushed against the bone above the eye for stability. Besides the fully retracted and fully extended positions, the eyecups have two intermediate positions or "detents" which are apparent when rotating the eyecups. These intermediate steps allow them to be set at the point particularly advantageous to your eyes. The eye relief, or the distance your eyes can be from the ocular lenses and still be able to see well, is very good for the 8X and 10X configurations and still good for the 12X configuration. This is of particular interest for people who wear eyeglasses and find that they're not seeing the entire field of view. We suspect that even the 12X will be useable by most eyeglass wearers, but you may wish to verify that before ordering. The focus wheel on our test Monarch 5 ED binocular turned clockwise from close focus to infinity in 1.5 revolutions. This is of interest from two perspectives. First, some of us have exclusively used binoculars which turned one way or the other and we've developed a habit that's difficult to overcome! Secondly, the 1.5 revolutions indicates that the binocular has a relatively slow focus. What are the results of a slow focus? If you're outdoors for the day and actively using your binocular most of the day, you'll find your fingers becoming very tired if you're shifting your binocular's focus frequently. We are unashamed in our appreciation for a binocular which goes from close focus to infinity in a single revolution of the focus wheel. The single revolution hits the point of being neither too fast nor two slow for most users. It allows a binocular user to hit the sharp focus point quickly, without losing an important view due to needing to tensely nudge the wheel "just enough" to get a sharp focus and not overdo it. If you've not tried a single-revolution wheel, we encourage you to give it a try! Some do find that they prefer the 1.5 revolution focusing mechanism, however, and this Monarch 5 ED binocular will satisfy their interests. In keeping with the other Monarch binoculars in Nikon's stable, this one uses a ring mounted below the right eyecup to personalize the diopter adjustment setting for your eyesight. It doesn't lock to keep its setting, but it does the next best thing and simply sticks in place thanks to its stiff action. This design approach is one that many other manufacturers use in designing this necessary feature of a binocular and we've generally found that, although perhaps not quite as effective as a locking adjustment ring, it works well. The settings seem to be in keeping with the majority of other binoculars we've used. Our test binocular had "Made in China" in the rubber armoring along the underside of the hinge — the same general area where the serial number is located. We've been favorably impressed with Nikon's ability to maintain consistent quality levels in their binoculars which are made in China. Based on a review of the Nikon manufacturing plants located internationally and which are listed on Nikon's web site as this article is being written, it appears likely that their binocular manufacturing is likely contracted to Chinese optical companies and, like other, similarly successful agreements, Nikon most likely works very closely with their quality control. For many of us, the quality of a binocular's body is significant, but nothing to compare with the importance of its optical quality! 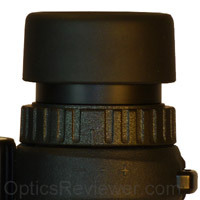 For us, the most important part of any review is the part that deals with a binocular's optics. If we keep the objective lenses the same diameter and increase the magnification power of a binocular, optical laws dictate that the field of view must narrow with each magnification increment. We can see that principle at work in looking at the field of view for the three different magnification powers for the Monarch 5 ED binoculars. Our perspective is that a wide field of view is a significant benefit and that usually, if one has to choose between two binoculars which are closely similar in all other respects, the binocular with the wider field of view should be selected. The reason for this is because, even if the periphery of the field of view is a bit blurred (as most are), if you at least can see movement you'll be able to swing your binocular to see the activity in the center of the field of view. If you never see the movement because of a narrow field of view, you'll never know what you missed seeing. If we had our wishes, the field of view with the Nikon Monarch 5 ED 8X42 binocular which we bought for this review would have been a bit wider. It's a good binocular, it's just that a 6.29° field of view is not particularly large! How Big is the Sweet Spot? In all the binoculars we're presently aware of in the Monarch 5 ED's price range, the optics have an area in the middle of the field of view in which the details are particularly well resolved. Within that area, the contrasts and colors will be better than they are as you move away from the center of the field of view. Informally, we call this center area the "sweet spot." Around this sweet spot the resolution of the finer details begins to soften, imperceptibly at first, due to curvature, and gradually becomes increasingly discernable until it results in a blurred or fuzzy peripheral view. Binocular companies struggle with how wide they'll be able to make the sweet spot (how small the blurred&sol;fuzzy area can be made) at a given price when an accounting is made for all other items or features. 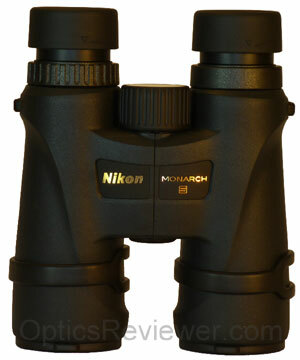 When we tested the Nikon Monarch 5 ED 8X42 binocular which we bought for this review, we found that we were able to discern the slight softening of the viewed image at about 50.0&percnt; of the radius from the center of the field of view. The view at this point was still very good and it was only by looking very closely that we were able to note that small softening of details. At about 64.3&percnt; of the radius from the field of view's center, it appeared to us that the softening of details started to be sufficient to say that they were beginning to blur slightly. We're enthusiastic, as our regular visitors know, about the benefits of a broad sweet spot. If we had our preference, we'd have a sweet spot that's a bit wider. 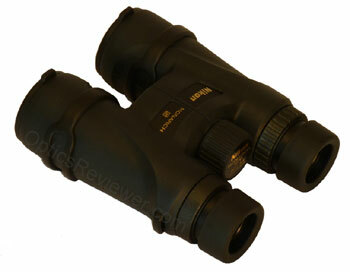 Having said that, we found that our test binocular was very enjoyable to use! One reason binoculars with objective lenses made from ED glass are better is because they reduce chromatic aberration. The way they accomplish this is by reducing the small amount of blurring at the line where colors change in the viewed image. If you're thinking ahead as you read, you'll quickly realize that this has other benefits, one of which is a significant improvement in the resolution of details, the brightness of a view, contrasts, and, of course, the rendering of colors. The Monarch 5 ED's reduction of chromatic aberration is good. We wouldn't expect it to completely remove&sol;eliminate it and it doesn't, but our experience with the test binocular we bought for this review was good in this respect. This is probably as good a place as any to mention that, as we would expect of a binocular at this level of quality, this binocular is fully multicoated and phase corrected. We were pleasantly surprised by our test binocular's performance in low light conditions. It performed at an above average level when compared to others in its price range. We found that ours had the ability to punch into the shadows with relative ease. When the sun had gone out of sight and it was too dark to still call it "twilight," we found that we could still use the Monarch 5 ED to see significantly better than with many other optics. That sort of thing makes binoculars fun. The dielectric reflective coatings on the prism certainly play a central role in this brightness, but theory would point to the ability of the ED glass to enhance brightness. How of the brightness should be attributed to the prisms' reflective coatings and how much attributed to the ED glass, we don't know. Because the Monarch 5 ED seems significantly brighter than its predecessor, we suspect that Nikon put more dielectric coating layers on the prisms of this new, updated model. It's also possible that Nikon has developed enhancements to the other glass coatings which would make a difference in this binocular's brightness. The bottom line is that this binocular performs well in the lighting before sunrise and at twilight — it's better in low light than its predecessor. When we tested our Monarch 5 ED 8X42 binocular in strong light, it performed well. Whether we took it out in the early morning or late evening and used it at shallow angles to the sun or in looking across water and dealing with reflected light, we felt it controlled the strong light at an average or better level, depending on the circumstances. We're unaware of any binocular with which glare cannot be induced, but our test unit performed well. When we took it out at night and looked at bright parking lot lights, we found that it provided good control of light in those circumstances, as well, with nominal spiking or glare. How Short a Distance is this Binocular's Close Focus? It's not infrequent that a binocular owner wants to use the instrument to view something, typically a living creature of some sort, from a relatively close distance. We enjoy this for the hymenoptera family of insects (that includes ants, wasps, bees, and such — a binocular keeps us from being stung&sol;bitten) as well as butterflies and occasionally moths. To optimally enjoy this activity, one needs to have a binocular that can focus clearly on activity or things that are a relatively short distance from the user. Nikon specifies a close focus for the Monarch 5 ED of 8.2ft (2.5m). We promote the idea that eight feet or less is ideal, but we're certainly not going to fuss about two tenths of a foot! When we measured the minimum distance at which we could achieve a clear resolution of details with our test binocular, we found it to be 7.5ft (2.3m). This is comfortably within the eight foot limit we suggest as the maximum close focus distance. Nikon has provided stiff plastic rain guards which have drawn criticism over the years because they didn't seem to stay on the eyecups. This has been a sore point with many Monarch owners for a while, which we felt had been improved upon with the Monarch 5 ED's predecessor model, but which doesn't seem to have substantially changed for this model. On the positive side, if both ends of the rain guard are attached to the neck strap, the friction of the neck strap's nylon in that area tends to help keep them in place. If the "clip" on the right side of the rain guard isn't attached to the neck strap or the binocular isn't slightly flexed (at the hinge), the rain guard can still slip off unexpectedly. The workaround for this is to simply have the binocular adjusted for your inter-pupillary distance and the friction&sol; tension will usually keep the rain guard in place. We're delighted to be able to tell you that the lens covers for the Monarch 5 ED's objective lenses are among the best we've found. They're made of a rubber-type material that holds to the inside surfaces of the barrels. We've had binoculars which used a harder, more plastic material for their objective lens covers and those are typically difficult to use and are better simply removed from the binocular. We found that the Monarch 5 ED's lens covers were ones we actually enjoyed using! We like the Nikon Monarch 5 ED binocular and found that it was easy and enjoyable to grab it as we headed out the door or wanted to look at something through the kitchen window. It's our perception that there will be a lot of outdoors people getting this binocular — whether its for birding, general outdoor use, rural home security or keeping track of livestock, or hunting — and enjoying the view it provides. 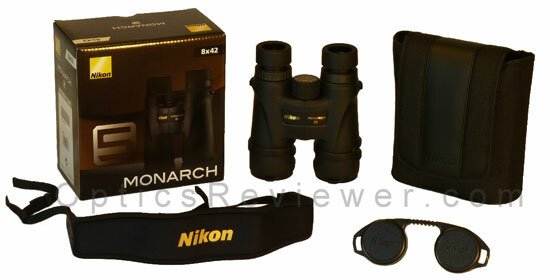 The following links take you directly to the Nikon Monarch 5 ED binocular selections at Amazon.com and Amazon.co.uk for your convenience. You know how kids are when something is purchased and they want to get everything out of the package to see what all is there? We're the same way! What all is in the box?!? The carrying case which Nikon provides with the Monarch 5 ED is lightly padded nylon with a soft, lint-free fabric lining. There is a vinyl trim that runs from the bottom of the flap over the top of the case and partially down the back of it. This trim has been stitched to the back of the carrying case so as to provide a place to thread your belt through and we think it's an excellent way to hold onto the case when the binocular is not inside the case, given that the case doesn't have a shoulder strap. The belt loop is probably not strong enough to hold the weight of the binocular, however, so we suggest simply hanging the binoculars around the neck when they're in the case. The binocular also comes with a neck strap that feels like neoprene to us — it's a nice wide one that helps to distribute the weight of the instrument and make it feel light and comfortable. The rain guard and objective lens covers (mentioned above) are included in the box as well as an instruction booklet and a warranty card. Because we were interested in how they compared against each other, we compared the Zeiss Terra ED to the Nikon Monarch 5 ED binocular — two binoculars at comparable price points. We're happy to share our thoughts with you through our comparison article: Nikon vs Zeiss. The Monarch 5 ED's price range puts it head-to-head with the Carson 3D ED as long as they both maintain their present prices. Since we've had the Carson 3D ED as a best buy for a while, we wanted to know which one we'd choose if we could have only one binocular. 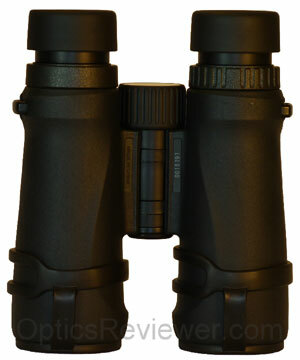 Was it be time to change our recommended binocular at this price? We put them side-by-side in this Carson 3D ED vs Nikon Monarch 5 ED comparison. There's another article which you may find useful — it compares the Monarch 5 ED vs 7. Nikon's 25 Year Limited Plus No-fault Warranties provide very good protection for prospective owners. They cover the binoculars during the time that we would expect them to be at their best and functioning optimally. If your binocular should require a service or repair not covered under the limited warranty, you'll want to enclose $10 in with them and you'll be responsible for return shipping and handling. They're covered even if the problem was your own fault. It's a good warranty.